2.) Clustered Index stores actual row data in the leaf level and nonclustered index would stores only those columns which are included in nonclustered index and pointer to the actual row which may be in clustered index or in heap (know more about leaf, heap, RID etc. from here). Like clustered index, you can have one or multiple columns defined in Nonclustered Index too. Order of the column defined in Nonclustered plays an important role to meet Index seek, as I told you in previous article too that Index seek is good than Index Scan, so one should try to meet up Index seek as long as possible. We are going to use same database and “Orders” table defined in previous article “Clustered Index in SQL Server”. You will see your nonClustered Index Seek in your execution plan. There are few more indexes under the same category like INCLUDE columns, Filtered Index, Covering Index which we will be exploring very soon. This entry was posted in Uncategorized and tagged index, Microsoft, noncolustered index, Ritesh Shah, sql server 2005 on June 20, 2011 by Riteshshah. This is one of the best answer so far, I have read online.Just useful information. Very well presented. 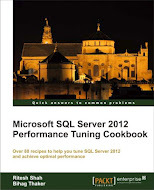 I had found another good collection of index in sql server over internet.